Gone are the spiders from Perrier Street. What can I say? The exterminator works. 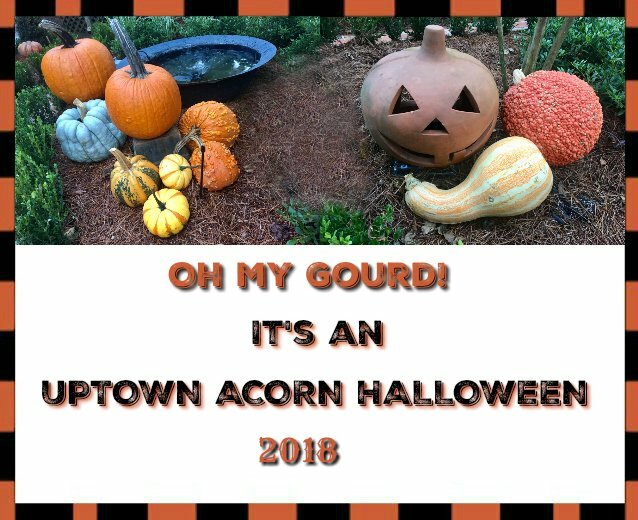 I tried to keep the Halloween decorations at the Acorn Cottage tame and classic. I especially adore the black feathered wreaths hanging in the front windows of the sunroom. Each feathered wreath also has a crow resting in the center. The larger crow wreath also hangs on the window on the front porch. This wreath was a Grandin Road purchase several years ago. A new addition to my Halloween decor is the 5 foot mummy. I added crows and bats to add some pizzazz. The mummy is also from Grandin Road. Grandin Road has the greatest selection of Halloween decor around. The front fence holds the black branch and twig garland filled with flicker flame lights. The look is spooktacular at night. 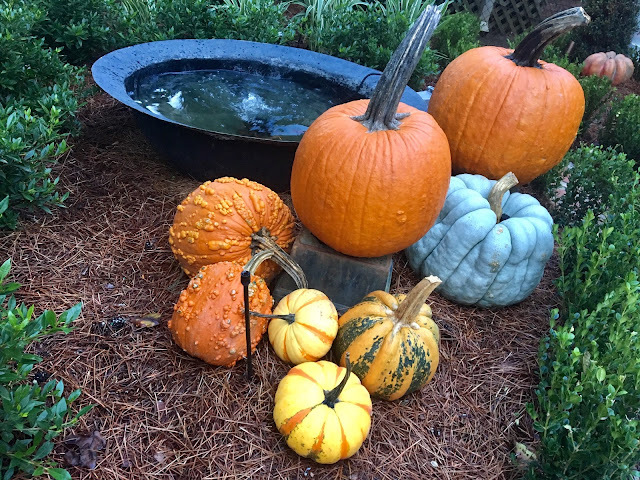 Pumpkins and gourds (from Hazel's Market) fill the spaces in the newly landscaped garden. 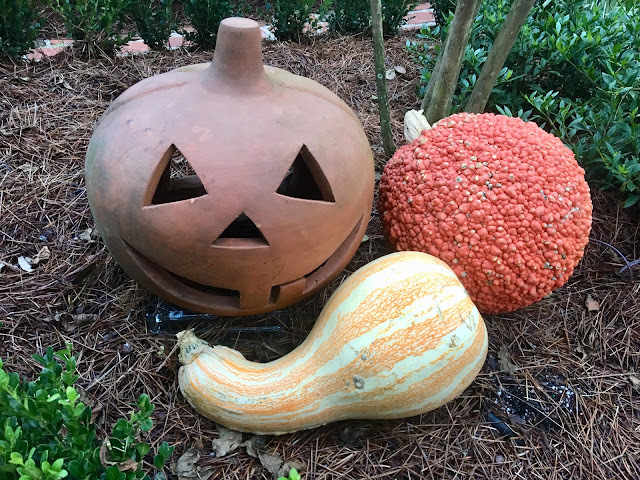 The terracotta jack-o-lantern has been used since my Atlanta home in 2004. It was purchased from my favorite shop in Atlanta, Boxwoods Gardens and Gifts. I am looking forward to some cooler temps and a spooktacular Halloween season. In the next couple weeks, I'll be sharing some of my favorite Halloween decor. I hope you will stop by. Don't be scared! Oh boy I do love it all Ron! Loving the black wreaths- they really catch the eye. I like how the pumpkins and gourds look in the new garden area. Really cool design on the fencing- can’t wait to see it lit up! I love your enthusiasm... Great wreaths...that mummy is scary!!! This is awesome Ron. Loving the black wreaths and that mummy looks real. The garden with the pumpkins and gourds is gorgeous. Lookin good!